It hadn't occurred to us all these years until the other day, quite by accident, when the notion just popped into our head. What notion? That our approach to photo gear has its origins in our experience with golf equipment. 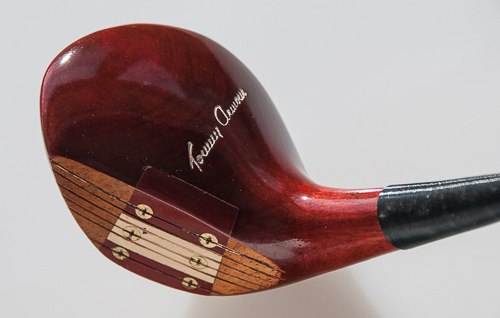 Tommy Armour Four Wood. MacGregor Eye-O-Matic persimmon head. We haven't played golf in decades. But we took up the game in grammar school and used to hike up to Harding Park along Lake Merced as a teen, making divots and spraying sand on the greens all summer with a neighborhood buddy. It got a little too expensive to be a regular hobby, frankly, but golf runs deep in the family. The first lesson we learned about golf goes back to the early 1900s when our great grandfather emigrated from Italy with his wife and two small sons. The Ferreras. Father and son. He found work at the Presidio Golf Club, a course built for the military installation on the northern end of the San Francisco peninsula. 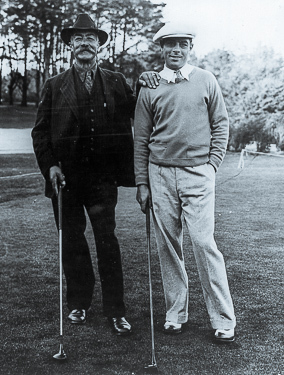 We imagine he took the family to the course the day Teddy Roosevelt visited, but we're just imagining things. He was a gardener at the golf course. And he had a fellow immigrant friend who worked alongside him. They both had boys the same age and both had Americanized names. Johnny and Charlie. The boys became best friends for life. After a storm, their fathers would comb the course for fallen branches and whittle them into golf clubs for the boys to play with. As gear goes, those carved clubs were no prize. The striking surface could not have been very flat (not for long anyway) and the shaft couldn't have bent much before breaking. But both boys learned the game on those carved clubs. Johnny. They had fun, too. And they learned it well. Johnny became champion of Lincoln Golf Course and took home the low gross trophy at the Owl Drug Company's annual executive and staff tournaments. Charlie didn't do badly either. He was a two-time U.S. 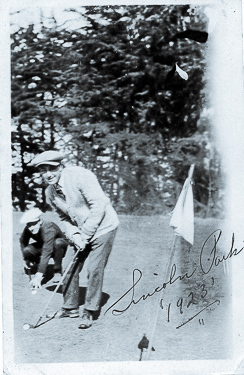 Amateur Public Links champion (in 1931 and 1933). There wasn't any money in golf in those days so Charlie worked in a warehouse where he was crushed to death in an accident suddenly one day. Johnny was stunned. Life had been cut short for these two friends for life but not their friendship. The lesson of those branch golf clubs? You don't need new gear or even good gear to start learning. In fact, you'll learn more with stuff that's harder to use. Our first 35mm camera was a flea market Argus C3 with an inaccurate shutter and moldy lenses. We took the lenses apart, cleaned them and lived with the shutter to shoot Plus-X, Tri-X, Ektachrome and Kodachrome. When someone asks us what kind of camera they should learn on, we recommend a simple used model with aperture, shutter speed and ISO control. The more trouble you have with it, the more you'll learn. When you get wise to the limitations of branches or old technology, you're impatient to start using better equipment. But, you know, almost anything is going to be better. The trick is to make sure it's better for you. Johnny was our grandfather. And since Arnie and Jack were finally bringing money into the game, Gramps figured we should have a set of clubs. So he scouted around and found a gorgeous set of clubs we have never been able to part with that included three MacGregor Eye-O-Matic Tourney woods carved from hard persimmon. We had a hellacious swing. We whipped the club through the ball so fast, you couldn't see it. It was from playing baseball and always swinging for the fences. At our playground, we were the home run king. And with a wood in your hand, you swung for distance. The shafts on those beautiful woods were very flexible, designed for the very slow swing of an elderly man, apparently. 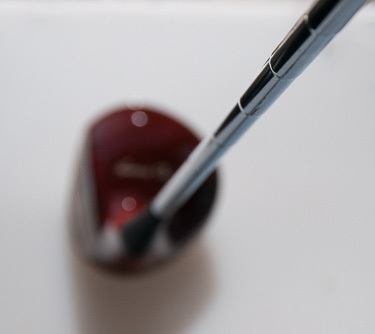 The consequence of mating a fast swing with a flexible shaft was that the club head never got back to square as it passed through the ball, following a good bit farther behind the hands than it should have been. So every tee shot was a slice. What we took away from this lesson is that you have to have equipment that works for you. It has to make it easier to capture the kinds of shots you like to take. It has to be designed for the work you do. A photojournalist doesn't work with the same gear a wedding photographer uses or that a sports photographer relies on. A landscape photographer doesn't use what a macro photographer uses. There isn't a best camera or best lens. There are different systems configured to your preferences. You want the right setup for what you do. Even with a full bag of clubs appropriate for your style, you can still blow the shot. You have to consider which tool to use when. And while there is always a reason to break with convention, there are situations that call for a particular tool. Like a sand trap calls out for a sand wedge. 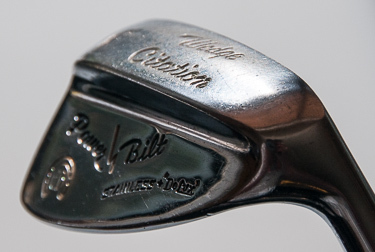 Citation Wedge. An indispensable tool. When only the top of your ball is visible in the sand, you need a club with a heavy heel that will drive through the sand and pop the ball up immediately so it clears the lip of the trap. There's really no substitute for a wedge in that situation. Your nine iron, for example, will cut into the sand without plowing through it. And, short of a shovel, that's the best alternative you've got in your bag. The lesson here is pretty clear, too. You have to choose the right tool for the job. A moderately long prime for portraits. Image stabilization for that long telephoto. A long macro for close-ups that you can't get close to. You need the right tool. That goes for software too. You can't expect a file browser to catalog your work. And you can't shoot Raw without mastering the Raw conversion settings of your image editing software. Golfers are notoriously fickle when it comes to putters. Watch any tournament on TV and you'll be amazed at the variety of putters. There have been so many desperate attempts to refine the art that the Professional Golf Association has had to lay down the law on what is and is not permissible. Wilson Julius Boros Putter. A lifelong companion. Using your putter as a cue stick (as shown above) is not permissible. Not only do golfers exhibit a variety of approaches but each golfer tends to vary their approach from time to time. In fact any time they are not putting well. 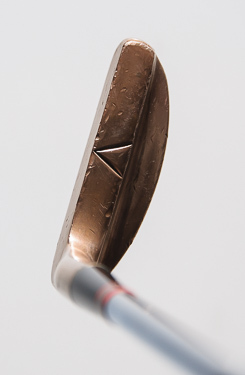 We've only used two putters in our lifetime and this is the one we always came back to. 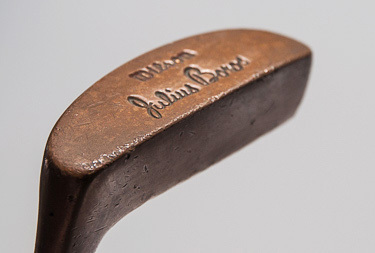 A plain old Wilson brass Julius Boros putter with a little arrow engraved on the top to advise us where to strike the ball. We were a pretty good putter, by the way. But whenever we used to hit a slump, we borrowed an old Power Bilt putter with a hickory shaft that looks like a one iron. It was just different enough from the brass Boros that we loosened up and got our rhythm back with Julius. The lesson here is, while variety may be occasionally helpful, you need a little fidelity to actually improve. In fact, making your tools second nature is the trick. They disappear. You just see the ball and the hole. You read the green, you see the break, you imagine the speed you need to cut that break just right. And it all happens without thinking about it after that because the putter is putty in your hands. And you can only do that if you stick with the gear you already have. Julius Boros. He won the Open twice, the Masters and the PGA. You instinctively set the aperture with a subdial or the shutter speed with another subdial or the ISO with some other control. Your hands know what to do without being told. You zoom, you focus, you fire -- all without having to remember where what is. The gear disappears. When you upgrade, you feel more comfortable with the same body style where the controls are in familiar locations and you don't have to think about it. This also goes for software where the user interface is familiar and the effects of the controls second nature to you so you can zip through a preliminary correction practically with your eyes closed and then know just how to tweak it. Although in both cases, it can often be refreshing to briefly try doing things with a different camera or different software. As we said, we're just reflecting on the origins of our own idiosyncratic approach to gear. Those old golf clubs. Which explain why we haven't bought a camera in 10 years. Why we keep acquiring odd lenses and using the oldest ones we own. Why we never have enough studio lighting or camera bags. And why we're quick to download the latest software updates and volunteer to beta test new image editing software. It's all because of our golf clubs, which have their roots in tree branches, our grandfather's love of the game and our own appreciation for what a tool can and cannot do for you. But just in case that appreciation makes these lessons a little more widely applicable than just to us, we thought we'd share it.